Bajaj Finserv is India’s one of the most popular non-banking financial company that provide variety of financial services such as instant loans, EMI cards, investment, insurance etc. With the help of a Bajaj Finserv EMI card, you can pay for all your purchases, from electronics and furniture to life care services and groceries on easy EMIs. I’ve seen some new customers with digitally stored EMI card facing problem in finding their digital EMI card number and other details such as expiry date and CVV number to use it as their EMI payment at online shopping websites. In this article, I will guide you step-by-step to get your Bajaj Finserv Digital EMI card number, expiry date and CVV in order to make payment online. Around a few months back, I purchased a smartphone from my nearby shop and converted it into EMIs using Bajaj Finserv. At that same time the man handling Bajaj Finserv for converting the amount into EMIs asked me to create a digital EMI card so that next time it will be easier to convert my purchases into EMIs by just telling my registered phone number to the cash counter. But, when I wanted to convert one of my online purchase into EMI using the Bajaj Finserv digital EMI Card, I got confused as I was asked to enter my EMI card number, its expiry date and CVV number. But, with some research I got my Bajaj Finserv EMI card number and other necessary details. Go to the official website of Bajaj Finserv and go to the Customer Portal by navigating Sign in » Customer Portal. In the customer portal area, enter your registered mobile number and then choose for OTP verification. Once verified, proceed with setting up your Bajaj Finserv customer account by providing your date of birth and other details. Once, you’re done with setting up your account using your registered mobile number, you will see your digitally stored EMI card. Here, you will be able to see the expiry date of your card but the EMI card number is still hidden. To get your EMI card number, you’re required to download Bajaj Finserv Wallet app in your Android or iOS smartphone. Once installed, login with your registered number and then verify it by OTP. 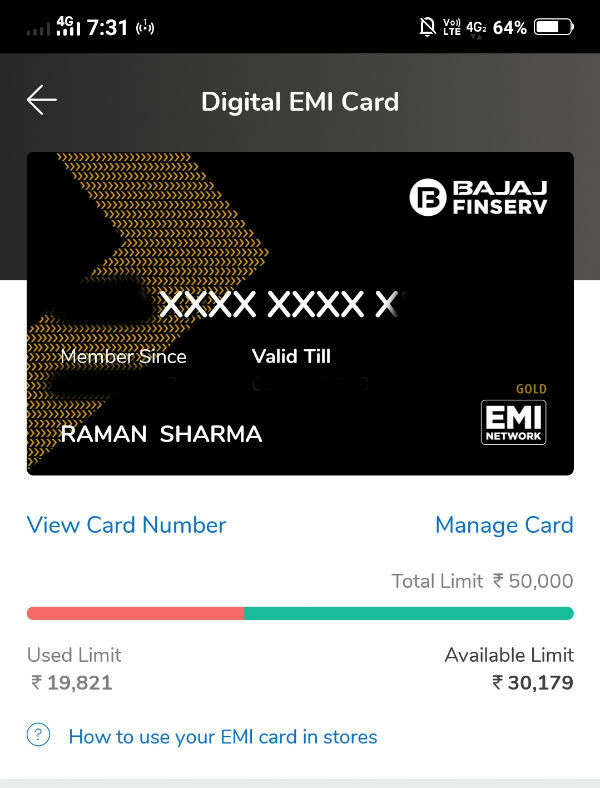 After you’re logged in to your Bajaj Finserv Wallet, as soon as you’ll click on the EMI icon at the top of the app screen and enter your date of birth, you’ll see your Digital EMI card (exactly looks like a physical credit/debit card). As soon as you’ll click on ‘View Card Number’ link and verify the OTP, your Bajaj Finserv Digital EMI Card number will be visible in front of you. That’s all about finding out the Bajaj Finserv EMI card number. In case you’re looking to find out the CVV number of your Bajaj Finserv EMI Card, let me tell you that it’s not required in my kind of online transactions, and I found it optional to enter expiry date of the card at many eCommerce platforms.